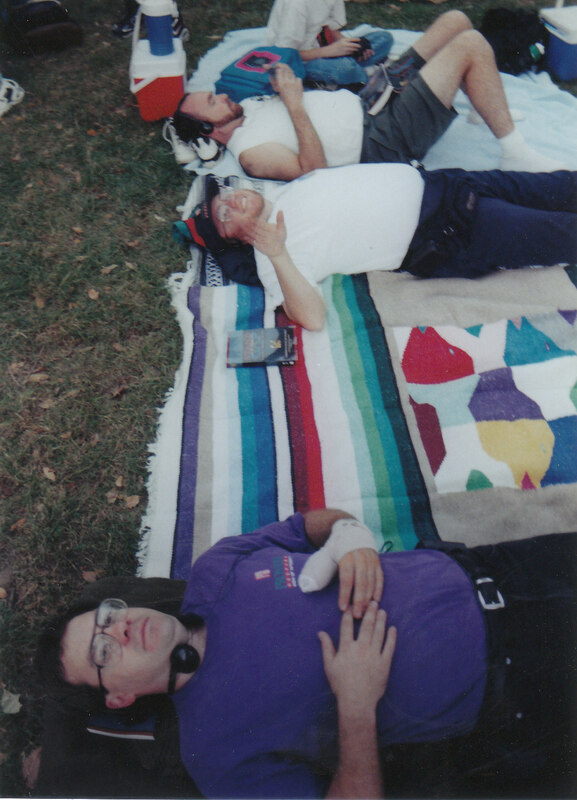 Steve, Kevin and Scott await the festivities on the National Mall, October 1997. 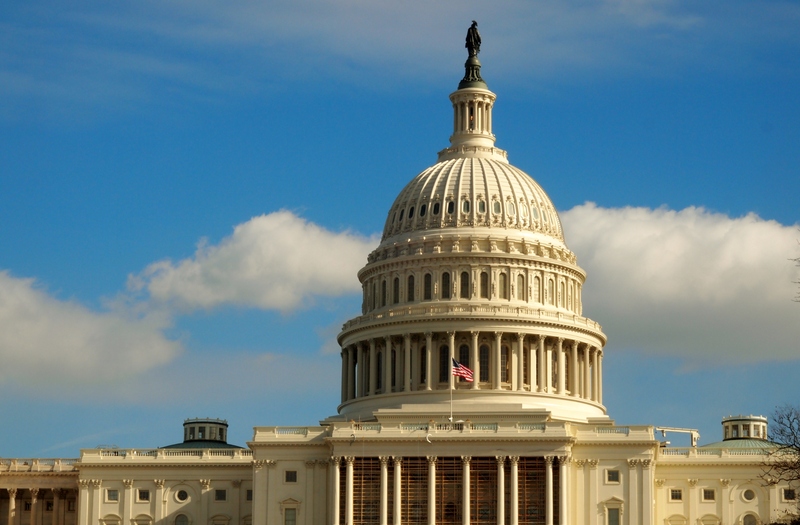 I’ve been to Washington a total of four times in my life: Once for the “Stand In the Gap” event on October 4, 1997 and three other times for business. With each visit, I am amazed by the grandeur of the place, the scale of the Capital and the beauty of the art and monuments. My time in DC is always short so I’ve never been in a museum or gone on a tour. I’ve never entered a building other than to buy a coffee and use the restroom. My business trips take me to Bethesda but each year I make sure I jump on the Metro and travel to the Mall. I see the sights, take some pictures, and marvel once again at our Nation’s Capital and the beauty of this city. But this past week, as I walked the length of the Mall, something new struck me: Many places around the world construct obelisks and statues to honor their great leaders; those who rose to fame and power and shaped the world with their words and actions, both good and bad. And we have our fair share of those great granite tributes. But we also have something more. In Washington, DC, flanking the Washington Monument and the Lincoln Memorial are two fantastic structures that honor men and women, named and yet to be named, who came from little towns and villages across this country to give their lives to protect the freedom we so enjoy. 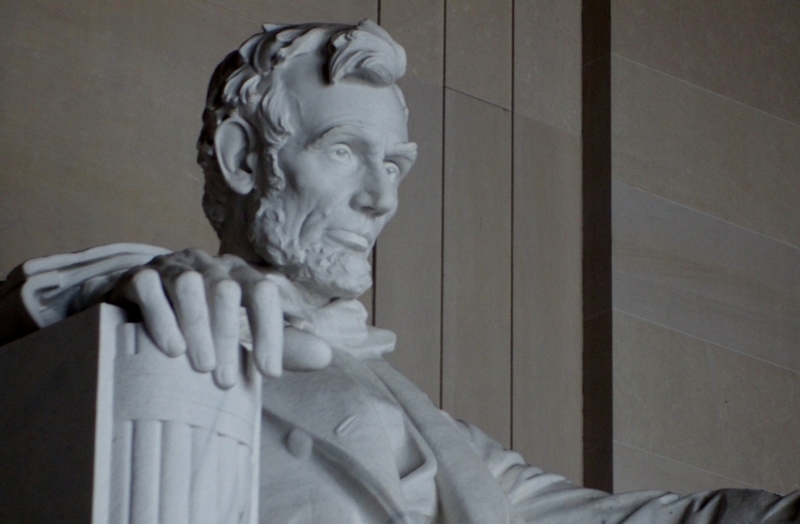 These beautiful memorials tell a story of a country who is led by great men and who is made by every man. 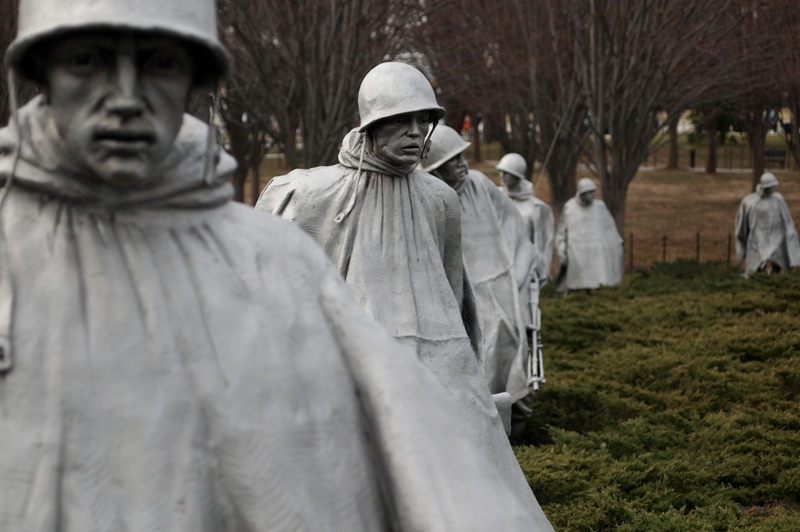 The Vietnam War Veterans Memorial and the Korean War Veterans Memorial both stand as tributes to the brave men and women who honored their country by serving, fighting and dying. Some volunteered. Many were drafted. But all should be honored. All should be thanked. 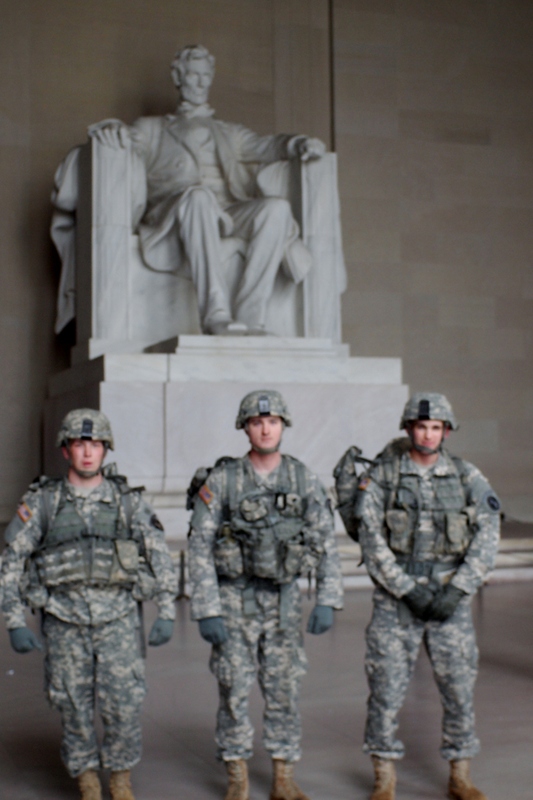 Three young men stop to allow pictures in front of the Lincoln Memorial, January 23, 2013. At the steps of the Lincoln Memorial, several service men were hiking the mall, 60-pound packs loaded on their backs. Their boots pounded out a rhythm on the marble steps, all the way to the top of the monument. As they stood, hunched over, catching their breath, many people looked at them in wonder. I approached them and spoke to them a bit about where they were from, their training and those loaded packs. I asked for a picture and they were happy to oblige. As we parted, I shook their hands and thanked them for their service and asked God to bless them in their duties. I am thankful for young men and women who volunteer, knowing that they are likely to face battle. I am grateful that they are willing to serve, knowing the risks. But I pray that they will never need a monument of their own. What beautiful writing my friend!!! I so agree. Every veteran of every war should be honored for the freedoms we all enjoy and those who paid the ultimate sacrifice should never be forgotten or trivialized. 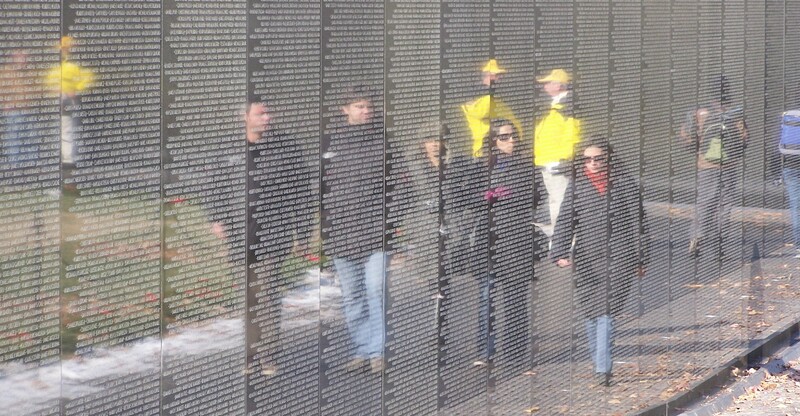 So, when you or anyone meets a veteran, especially those who served in Vietnam, thank them for their service. You will be amazed at the reactions you will get. God bless you for writing this which serves as a reminder for me to do the same.